Miss Berry has received a letter from Thomas Berry, Jr., and believes that the letter contains "many things that may be undertaken." She doesn't know what to do about it, but she has already called up Mr. Maddox for advice, and a copy of the letter has been enclosed to Miss Cora Neal. An exhibit about the schools has been sent to Macy's store. 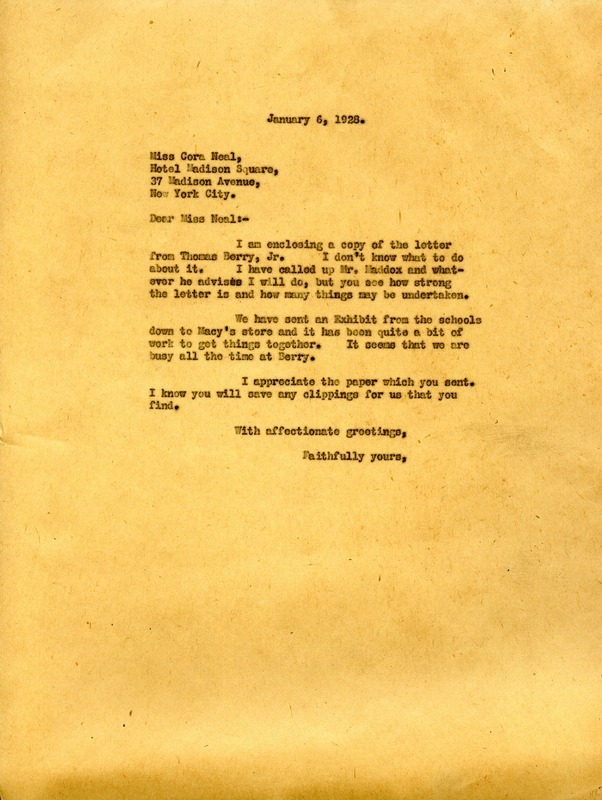 Martha Berry, “Letter to Cora Neal from Martha Berry.” Martha Berry Digital Archive. Eds. Schlitz, Stephanie A., Sherre Harrington, Monica Langmeyer, et al. Mount Berry: Berry College, 2012. accessed April 23, 2019, https://mbda.berry.edu/items/show/8518.